Sunshine Coast, 23 November 2017: Sunshine Plaza today announced it has lodged a development application with Sunshine Coast Council for a high ropes course as part of the $400 million redevelopment currently underway. On completion, Sunshine Plaza will be home to the first and largest high ropes course at a major regional shopping centre in the country, incorporating a 21-metre-high viewing deck and ten zip lines with the longest one at 130 metres across Cornmeal Creek. * Lendlease Head of Retail Gary Horwitz said in a constantly evolving retail market, being agile and responsive to customer needs was critical to retail shopping precincts thriving in the future. “The high ropes course brings a future dimension to the shopping experience with an experiential entertainment offer that will attract locals and visiting tourists. “The future of retail is bright. Sunshine Plaza is situated along Cornmeal Creek and customers want to enjoy places that offer a broad range of experiences in vibrant coastal environments. Delivering exciting new entertainment and leisure activities will enhance the connection with the creek and bring a full day of adventure and fun to the centre,” Gary added. Visit Sunshine Coast’s Chief Executive Officer, Simon Latchford said the high ropes addition embraced the Coast’s adventurous spirit along with its love for the outdoors and nature. “This exciting addition will further enhance the Sunshine Coast’s tourism offer and provide a long-term boost to the local economy,” Mr Latchford said. Adventure high ropes specialist, Trees Adventure will design and operate one of the first ever shopping centre high ropes courses in Australia. The unique design will capture Cornmeal Creek’s natural beauty and have a strong visual connection to the new Cornmeal Creek casual dining precinct. The course will include easily changeable and sustainable challenges with minimal ongoing environmental impacts. 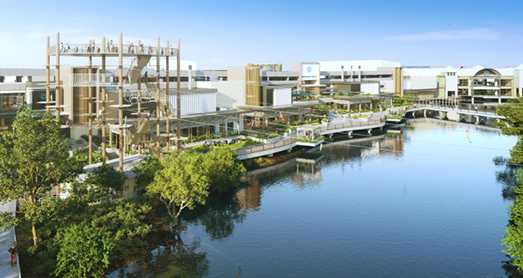 Commencing its expansion in late 2016, the $400 million redevelopment of Sunshine Plaza will see the centre expand from 73,000 square metres to over 107,000 square metres becoming the largest retail centre north of Brisbane. The centre will house an enhanced retail mix with the region’s first David Jones department store, a new BIG W, a refurbished Myer, and over 100 new specialty stores.